Episode 98 – Charles Dickens has a lot to answer for! Its the last episode before Christmas…there very well may be some ballet dancing sheep! Its quite documented on this podcast that I’m not overly fond of the festive season. This year we’ve cut way back on the commercial aspects of it, but there are many other reasons why I don’t find the festive much fun. I’ve had people say “oh, you’re all Bah Humbug” *sigh* Ebenezer Scrooge and Charles Dickens sure have a lot to answer for! I know there are lots of us, for whatever reason, don’t enjoy Christmas. I just want to say, I get it. I support you. I hope it is peaceful and calm, and whatever you want it to be. And if you hear of someone who says “oh, we’re not really doing Christmas this year!” and maybe they cast a downward eye – try to think before you call them a humbug! It may be more hurtful than you think! Something we can do – just a wee thing – is the KnitBritish Small Gestures pattern swap. We’ve done this for four years now, I think, and it is a lovely feeling indeed. Not taken part before? Well this is what you do. Go on over to ravelry and make sure your wishlist is in good order, maybe add a few more things and tidy it up a bit. Then go on over to the small gestures thread and sign up by Tuesday. Come 21st December I will pair you up with a partner and we’ll gift out partner a pattern from their wishlist and get one from our wishlist in return. It couldn’t be simpler or nicer! Thank you for taking part every year and making it special. Let’s all have a Drink, Eat, Chat, Knit day on 13th January. There are no places left for the Edinburgh day to celebrate our 100 episodes, but that doesn’t mean you can’t have your own party too. Mazzy has organised a get together in Bath and I’ve opened a thread in the KB group for any interest for those who also want to get together. Use the hashtag #KB100DECK on social media on the day and let’s try and connect online too. Jumper Buntings are coming in from all over and are the joy of my life! Thank you to everyone who has, is and intends to knit one. The deadline for me to get them should be the 12th of January, and anyone coming to the Edinburgh day can bring theirs with them. The pattern for the bunting was designed by Sue Stratford for Save the Children. It is a free pattern, but if you would like to send Save the Children a quid or two, if you are so inclined, you can do that by clicking this link > > > DONATE TO SAVE THE CHILDREN. We’re doing a Blacker PodKAL again! 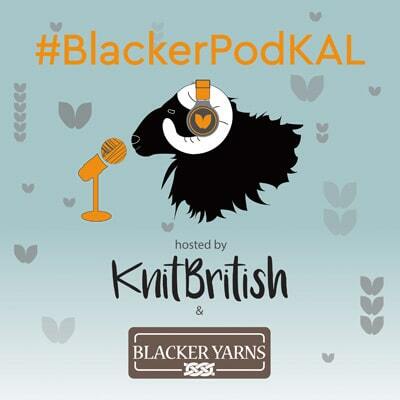 This is the KAL hosted by myself and Blacker in the the run up to EYF and our Blacker Yarns Podcast Lounge! This C/KAL is open to everyone, whether you can make EYF or not. Tag your projects blackerpodkal on Ravelry and use #BlackerPodKAL on social media. 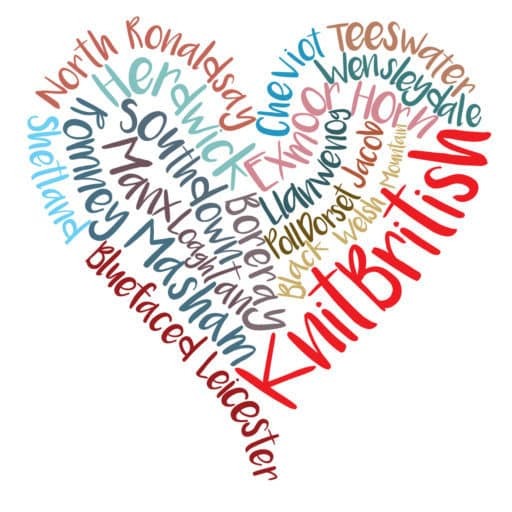 This KAL is once again hosted by Blacker Yarns and KnitBritish. The organisers of EYF are not involved with this KAL and should not be contacted with queries. 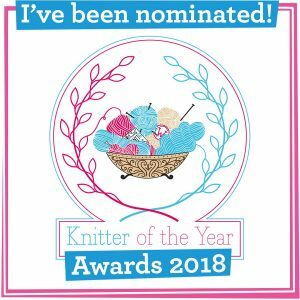 Once the Blacker Refresh KAL is over, we will start a new thread in the Blacker group and you can guarantee there will be more details on this soon, such as details of our meet up at EYF and of associated KAL prize details! What will you make? Maybe whatever you get gifted in our small gestures swap! Tis the season to have warm feet, isn’t it? I asked on Instagram last week what your favourite sock patterns are for keeping warm. Visit the image to see the amazing responses! High on people’s list were designers Tin Can Knits and Clare Devine and lots of you have a lot of love for no Nylon sock wool and yarn – hoorah! I love wool socks. My favourite pair are my pair of Winiwick Mum 8ply socks in The Knitting Goddess Two Flocks. I think that Joy says that this wool is not best for socks, but then I’ve taken that knowledge and I’ve used my own due dilligence when it it comes to these things; a smaller needle for heels and toes and looking after any pills. I love them, they are so warm and the spin is quite firm for a nice warm sock. On the topic of socks, I’ve been trying out a new yarn and it is from New Leaf Yarns. As you will remember Jane is really interested in creating alpaca blend yarns, and this is quite unique; 4ply, soft and haloey, but with an amazing tensile strength and Jane hopes it will be a great yarn for no Nylon socks. The fibre content is 60% alpaca, 25% BFL and 15% Teeswater. For me, I do like a high twisted, even spun yarn with a little spring in the wool for socks, so I was honest and said I wasn’t sure with this one – I could only imagine lacey, gauzey shawls in this yarn, but I knit a teeny sock sample as well as a lacey swatch. Between the fingers the wool is very silky and there is a lovely soft whisperyness. I love the soft grey, which has darker natural shades running through, which gives a soft marl. While it did flow through my fingers, I did find that the yarn was easily spliced with my pointy 2.25mm bamboo needles, though this may have been my technique, as I was fiddling a small sock on three needles. The knitted fabric is a softly fuzzed delight and I loved how it knitted up, however I would say that this would be a good sock yarn for someone who is really adept at sock knitting, which I am not. I always have a few attempts at picking up the stitches along the heel flap, and this yarn did not like to be tinked. There was floofing, but it is not so noticeable in the washed item. The other thing that happened after washing and blocking was that there was a nice bit of stretch in the fabric, which it did not feel whilst knitting. In the lace swatch I switched to 5mm Addis and cast on 30 stitches. This was a totally different experience. No yarn splicing and the yarn flowed even more through the hands. It knit up really quickly and I was really pleased with the results when it was washed and blocked. Look how open the lace is. That gauzey cobwebby halo over the lace is just incredible and makes me want to start casting on all the lace shawls. 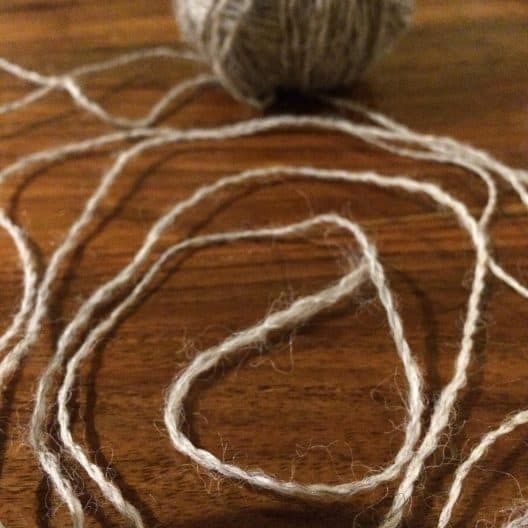 This is a lovely yarn which is going to be an incredible shawl yarn and a special sock yarn, for the experienced sock knitter, or (as I mentioned before) one that can think about the possible properties of the yarn and use your due diligence in creating a sock, with that knowledge. I will be dreaming about its lace shawls ability! The Alpaca, BFL and Teeswater yarn cost £20 for 100g/400m and you can find this and many other great Alpaca blends at newleafyarns.co.uk. 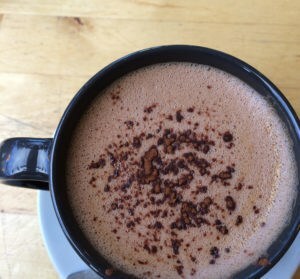 | Dance of the Sugar Plum Rough Fells and a short festive IG photo-a-day! For those of us who don’t mind a bit of Baaaaaa with your festive, here is – for the third year – The Dance of the Sugar Plum Rough Fells. This uses a recording made and kindly donated by my woolly mucker Felix Ford (you can find her recordings here on soundcloud) and then I took it and maaaaa-shed up with The Dance of the Sugar Plum Fairy, played by Kevin MacCloud (available on freemusicarchive). It will play out our show. Also I’ve concocted a way to keep me occupied in that yawning chasm of time over Christmas and New Year. 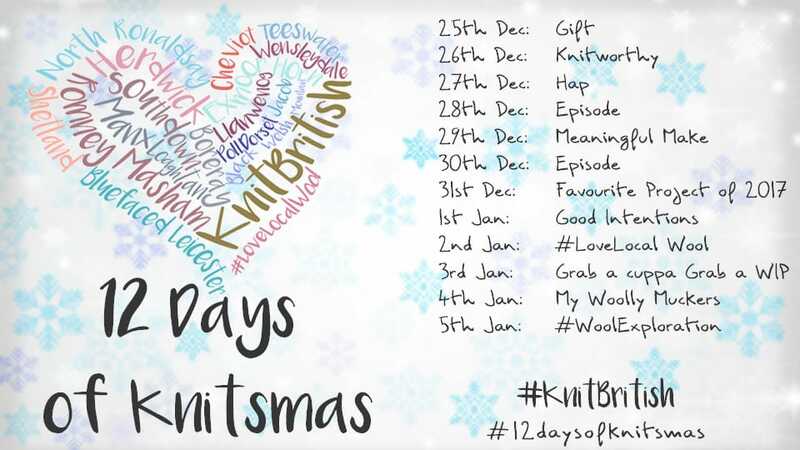 I’ll be posting a photo-a-day over the twelve days of Knitsmas. Do join me, if you like. I will be posting this on IG in a day or so, but feel free to save the image and repost. This bit got accidentally deleted from the end of the audio! It is thrilling to see so many people enjoying wool exploration with North Ronaldsay, both in the ravelry group and on social media. 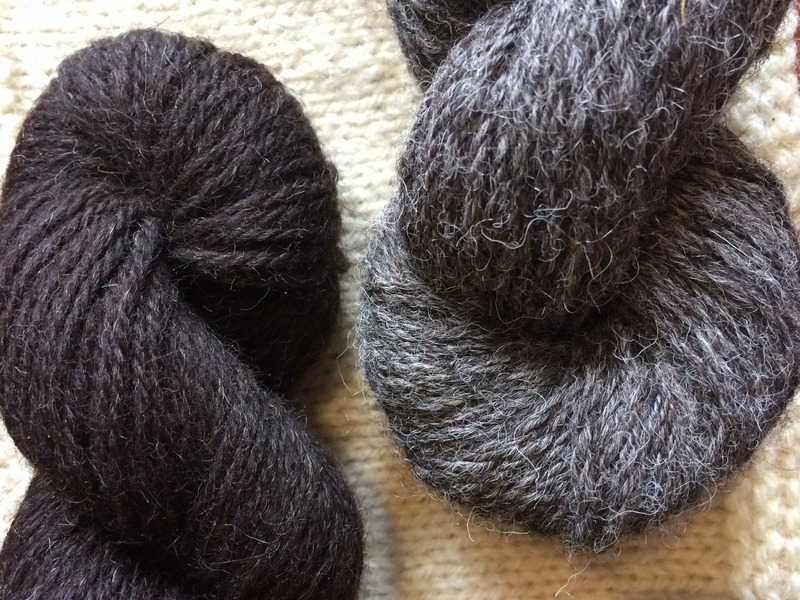 If you are not sure what we are doing you can read this post on Wool Exploration in 2018 and this post on our North Ronaldsay exploration . The deadline to do you reviews by is 28th December and I will be collating your information and discussing it on the podcast in January. The breed that we’ll be looking at next is Gotland! More information soon. Whatever you do this festive season, be safe, be warm and thank you for listening! Music: Carefree by Kevin McLeod and Singin’ in The Rain (demo) by David Mumford – Both are on FreeMusicArchive and are both shared under Creative Commons Attribution license. Images are copyright to those attributed in the caption or in the accompanying information, otherwise they are mine. Thanks to Jane from New Leaf for letting me try out her new yarn, free in exchange for an honest review. yeah, as I say in the podcast and show notes, I really object to the use of ’humbug’. For me, anxiety, grief & other reasons for not enjoying Christmas have nothing to do with ‘humbug’. My favourite sock yarn at the moment is West Yorkshire Spinners Signature and my go-to pattern is Sockmatician’s toe up recipe. Next year I’m going to make some dk weight socks with West Yorkshire Spinners Aire Valley and probably use the same recipe pattern. Felix is one talented individual, loved what she did with the sheep and the nutcracker – flippin awesome! We do not celebrate a traditional christmas and struggled over the years when we broke away from that tradition as our views changed. We have celebrated Hannukah when our children were small and I actually enjoy that celebration. I struggled over the years attempting to explain my reasons but now just don’t bother. Beyond the regligous aspects of this holiday the commercialism just makes me sick and I can’t stand going in the shops, so really avoid any shopping and only going into places that I absolutely have to. For those that really love christmas I think that is fantastic and I wish them all the very best … for me it causes stress and anxiety and not worth how exhausted i used to feel. I do feel traditions play an important part in our lives, but traditions can be self made and not necessarily follow the masses. Anyway enough of that — getting back to the knitting that lace swatch is GORGEOUS! haha! Thanks! Though I used Felix’s recording, with her permission, and maaa-shed it up with The Sugar Plum Fairy. Yes, the excesses of this time of year are awful. Happy, peaceful holidays no matter what you do. Ref picking up stitches on a heel flap: I’ve just done my first ever Fish Lips Kiss Heel (pattern explaining it is a very reasonable $1 on Ravelry; the name of the heel just describes how it looks) and that’s all done via short rows, no picking up stitches. I’m not enough of a seasoned sock knitter to decide which I prefer or when to use different types of heel though. My husband wears hand knit socks all year around, He used to go through socks in no time and had terrible sweaty smelly feet until he started to wear the wool socks I make for him. Now even in summer his feet do not smell, he loves the socks. I am going to try to spin some sock yarn myself probably out of one of the downs breeds for hard wear. I always knit a basic sock pattern for him.